Various studies have been made to attempt to study the interaction between Legionella pneumophila and the host cells. In this research, we successfully constructed a L. pneumophila mutant strain that stably expressed high levels of green fluorescent protein and used this strain to evaluate the adherence, invasion and proliferation of L. pneumophila in association with several cell lines, including seven cell lines [human macrophage-like cell lines (U937, THP-1), murine macrophage-like cell lines (J774.1A, Raw264.7), human bronchial epithelial cell lines (16HBE, Beas-2B) and human cerrical cancer cell line (HeLa)] which have been used as the host models of L. pneumophila, and two breast carcinoma cell lines (MCF-7 and MDA-MB-231). Our results showed that the two newly tested cell lines are able to support the intracellular proliferation of L. pneumophila, and there were some morphological variations during the invasion and intracellular replication of L. pneumophila in different cell lines. These results can help us find out the common and special patterns of invasion and proliferation of L. pneumophila within different hosts. This is conducive to our knowledge on the relationship and interaction between bacteria and host. Legionella pneumophila is a bacterium that is ubiquitous in natural and manmade water systems.1) It infects predominantly macrophages and lung epithelial cells leading to potentially lethal community- or hospital-acquired pneumonia.2) A variety of cell types, including protozoa, peripheral blood mononuclear cells, epithelioid cells, and non-phagocytic cells (A549, CHO-K1, and human cervical cancer cell line (HeLa), etc. ), have been used as host cells to characterize the intracellular proliferation of L. pneumophila and to study the relationship between L. pneumophila and host cells.3–5) In recent years, studies using molecular and genetic approaches have revealed virulence-related genes and genetic loci that contribute to the virulence of L. pneumophila, such as the mip gene and the iraAB and dot/icm loci.6,7) The mechanisms of cell invasion and intracellular lifestyle of L. pneumophila have been described in some cell lines.8,9) However, the difference of intracellular proliferation of L. pneumophila in each host cell line is still poorly characterized. Actually, some features are unique to the interactions between L. pneumophila and specific host cells.2) This study was undertaken to elaborate the features and expand the repertoire of cell-lines suitable to study L. pneumophila pathogenesis. In addition, breast carcinoma cell lines (MCF-7 and MDA-MB-231) harbors the expression deficiency of caspase-3 and mutated p53, respectively. Early studies indicated that the activation of caspase-3 or p53 can lead to the induction of apoptosis,10,11) which is used by host cell to inhibit bacterial infection and intracellular proliferation. Therefore, we employed the two cell lines along with several current model cell lines (including human macrophage-like cell lines (U937, THP-1), murine macrophage-like cell lines (J774.1, Raw264.7), human bronchial epithelial cell lines (16HBE, Beas-2b) and HeLa) as the host to study the adherence and intracellular proliferation of L. pneumophila and morphological characteristics of L. pneumophila infection. These findings expand our understanding of the relationship between L. pneumophila and host cells, which might be useful for further studies, including drug screening, determining pathogenic mechanisms, and functional gene mapping. L. pneumophila ATC C 33152 was grown at 37°C and 5% CO2 in buffered yeast extract (BYE) broth or on buffered charcoal yeast extract (BCYE) agar supplemented with L-cysteine and ferric pyrophosphate.12) For cloning experiments, Escherichia coli DH5α was cultured in Luria–Bertani (LB) medium.13) When required, media were supplemented with ampicillin at 100 µg mL−1 (for E. coli) or 50 µg mL−1 (for L. pneumophila) and chloramphenicol at 50 µg mL−1 (for E. coli) or 5 µg mL−1 (for L. pneumophila). The cell lines used in this study, that included the U937, THP-1, J774A.1, Raw264.7, 16HBE, Beas-2B, MDA-MB-231, MCF-7, and HeLa, were grown at 37°C in a humidified atmosphere containing 5% CO2 in RPMI 1640 (GIBCO) supplemented with 10% heat-inactivated fetal bovine serum (GIBCO) and 1% antibiotic–antimycotic solution (GIBCO). DNA manipulations were performed according to standard protocols. Enzymes were purchased from TaKaRa (Japan). The primers used in this study, which are described in Table S1, were synthesized by Beijing Genomics Institute (China). Genomic DNA and plasmid DNA were prepared using the Wizard Genomic DNA Purification Kit (Promega, U.S.A.) and the AxyPrep Plasmid Miniprep Kit (Axygen, U.S.A.), respectively. DNA fragments were purified from agarose gels for subcloning using the QIAquick Gel Purification Kit (QIAGEN). The suicide vector pBRDX, carrying the sacB and rdxA counter selection markers, was a gift from Y-J. Lu (Sun Yat-Sen University).14) For constructing pBRDX△thyA, the upstream and downstream flanking sequences of thyA were amplified by PCR using the primer pairs ThyAF1–ThyAF2 and ThyAF3–ThyAF4, respectively. Then, the two DNA fragments were concatenated using fusion PCR. The concatenated DNA fragment containing XbaI and BamHI restriction sites was ligated into pBRDX, and the resulting clone, pBRDX△thyA, was subsequently introduced into L. pneumophila by electroporation. Allelic recombinants of L. pneumophila were selected and plated onto medium supplemented with 10% (w/v) sucrose or 160 µg mL−1 metronidazole (to select for loss of the plasmid), and the recombinants were confirmed by testing for the loss of chloramphenicol resistance. The resulting metronidazole-resistant (Mtzr), sucrose-resistant (Sacr), and chloramphenicol-sensitive (Cams) strains were screened by PCR using the primers ThyAF1 and ThyAF4. The pJB908(gfp)Pmip plasmid, carrying the thyA gene and the strong Pmip promoter, was also a gift from Y-J. Lu (Sun Yat-Sen University).15) The pJB908(gfp)Pmip plasmid was electroporated into the L. pneumophila thyA mutant, and its identity was confirmed using fluorescence microscopy and flow cytometry. This gfp expression vector was maintained after dozens of generations in the absence of antibiotic selection (Fig. S1). The cells were seeded onto glass coverslips and placed into the wells of either a 6-well tissue culture plate at a density of ca. 1×106 cells well−1 or a 24-well plate at a density of ca. 5×104 cells well−1. U937 and THP-1 cells were incubated in fresh medium containing 50 ng mL−1 of phorbol 12-myristate 13-acetate for 24 h to differentiate the cells into non-replicating adherent macrophage-like cells. Prior to infection, stationary L. pneumophila △thyA pJB908(gfp)Pmip cells were washed with phosphate buffered saline, resuspended in RPMI 1640. The bacterial suspensions were added in triplicate to the cell monolayers at a multiplicity of infection (MOI) of 1 (1 : 1 bacteria: eukaryotic cells) or 10 : 1. After 2 h of infection, the infected monolayers were washed three times with fresh RPMI 1640 and treated with 100 µg mL−1 gentamicin for 1 h to kill extracellular bacteria. After five washes with RPMI 1640, the cells were suspended in fresh RPMI 1640 containing 10% heat-inactivated fetal bovine serum (without the antibiotic–antimycotic solution). After 2 h of infection, host cells were washed four times with RPMI 1640 to remove extracellular bacteria which were not adhesion to host cell. Then, the cells were resuspended and analyzed using a Coulter Epics XL (Beckman Coulter) equipped with a 15 mW argon laser (excitation wavelength, 488 nm). GFP fluorescence was recorded using the FL-1 channel. Data were collected for 104 individual events per sample. The fluorescent signals were analyzed and visualized using Exp032 ADC XL 4 color software (Beckman Coulter). Uninfected cells and cells infected with wild type L. pneumophila were used as controls. At appropriate time intervals, the infected monolayers were washed three times with fresh RPMI 1640 and treated with 10 μmL−1 Hoechst 33342 for 10 min to stain the nucleus, then the coverslips were removed from the plates and examined using a Leica DM4000 B microscope attached to a LAS V3.8 system. Blue laser (excitation wavelength, 488 nm) and UV laser (excitation wavelength, 335 nm) were used to view the status of intracellular proliferation of L. pneumophila and the host nucleus, respectively. Statistical analyses were conducted using SPSS Statistics 21.0 software (SPSS Inc., Chicago, IL, U.S.A.), and statistical significance was defined as p≤0.05. Correlation between adherence ability and invasiveness of L. pneumophila was evaluated using the Pearson’s test. The previous results by Mintz et al. indicated that the thymidine auxotrophs were incapable of intracellular survival or multiplication.17) We constructed the thyA mutant to make the plasmid of pJB908(gfp)Pmip requisite for bacterial survival or multiplication. To determine whether the growth is influenced by the thyA deletion and complementation, we examined the relative growth rates of wild type L. pneumophila ATC C33152 (Lp), L. pneumophila △thyA (Th), and L. pneumophila △thyA pJB908(gfp)Pmip (Th-gfp) in BYE medium by measuring the OD600. Bacteria were incubated in BYE in the absence of added thymidine, and the growth curve for the bacteria is shown in Fig. S1h. Consistent with previous observations,18) the Th strain did not grow in absence of added thymidine, whereas Th-gfp showed growth similar to that of the wild-type strain (Lp). In addition, the bacterial fluorescence tagged with GFP was measured by flow cytometry and all Th-gfp strains expressed discriminated GFP (data not shown). The invasiveness and intracellular proliferation of the three strains in different cell lines were also determined by measuring the CFUs (Fig. 1). The invasiveness of the Lp and Th-gfp strains in the different cell lines tended to follow similar trends, whereas the invasiveness of the Th strain was greater than that of the Lp and Th-gfp strains for most of the cell lines tested in this study. Th showed a greater than 10-fold decrease in viability when cultured inside cells without the addition of thymine to the culture medium. The intracellular proliferation of Th-gfp was essentially the same as that of Lp for all tested cell lines within the first 24 h. From 24 to 48 h, Th-gfp and Lp stopped replicating in the non-phagocytic cell lines (MCF-7, MDA-MB 231, 16HBE, Beas-2B, and HeLa). Based on the information above, we concluded that Th-gfp could be used as a model bacterium in place of Lp for studies on the invasiveness and intracellular growth of L. pneumophila within 24 h post-infection. 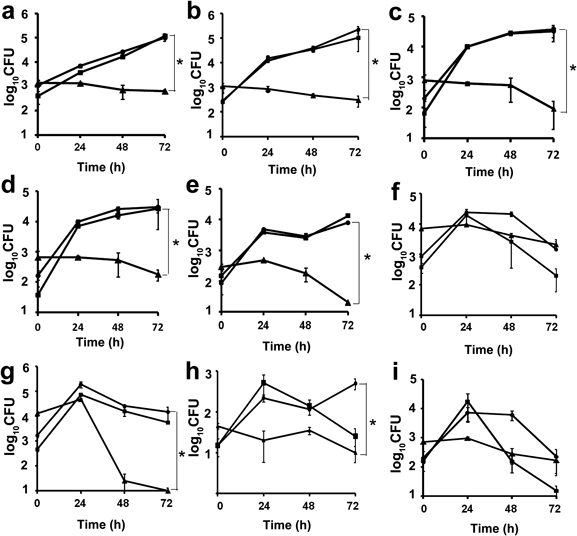 (a–i) Intracellular growth kinetics of L. pneumophila wild type (Lp) and mutant strains (Th and Th-gfp) in different cell lines. Cells were infected with Lp- (●), Th- (▲), or Th-gfp- (■), and the number of viable bacteria was determined over the next three days. Each point represents the average number of CFUs from triplicate wells. 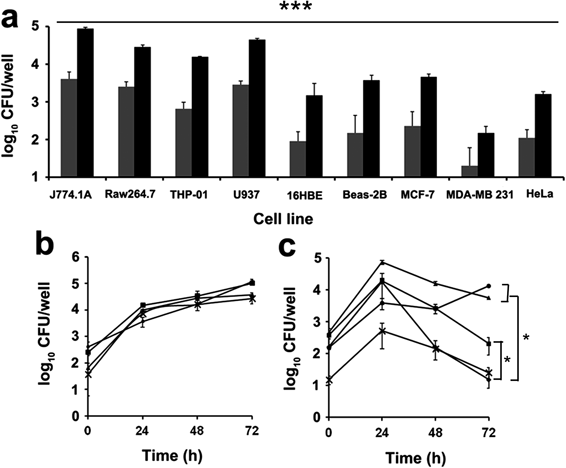 The cell lines used included (a) J774.1A, (b) Raw264.7, (c) THP-1-derived macrophages, (d) U937-derived macrophages, (e) 16HBE, (f) Beas-2B, (g) MCF-7, (h) MDA-MB 231 and (i) HeLa. * Significant differences (p≤0.01) at 72 h of culture tested by Scheffe’s test. Experiments were repeated three times, and error bars represent the S.D. The adherence ability of the L. pneumophila Th-gfp strain to different host cell line was evaluated by the percentage of the host cells with fluorescence which was defined as adherence rate and measured by using flow cytometry. The adherence rates were generally proportional to the MOI (Fig. 2). Under the same MOI, attachment of L. pneumophila to macrophage-like cell lines was greater than that to non-phagocytic cell lines. No significant difference in the adherence rates was noted among macrophage-like cell lines. At a low MOI, there was no significant difference in the adherence rates for the non-phagocytic cell lines; however, at higher MOIs, the rate of adherence to MCF-7 cells was significantly higher than that to other non-phagocytic cell lines, while the lowest adherence rates was detected in HeLa cells. The adherence rates of Th-gfp to these cell lines ranged from 0.6±0.3 to 98.1±0.4%. The cell lines used included J774.1A- (●), Raw264.7- (■), THP-1- (▲), U937- (×), 16HBE–(●), Beas-2B–(■), MCF-7–(▲), MDA-MB231–(×), HeLa–(◆); *** Significant differences (p<0.001) between MCF-7 and other non-phagocytic cell lines with MOI equal to 10 and 100 tested by Scheffe’s test. Experiments were repeated three times. Error bars represent the S.D. The capacity of the Th-gfp strain to enter macrophage-like cells and non-phagocytic cells was evaluated by determining the CFU/well of L. pneumophila strains inside the cells after 2 h of infection. Obvious differences were observed in the invasiveness to the different cell lines (Fig. 3a). No matter at high or low MOI, the J774.1A cell line was determined to be the most appropriate and robust host since it showed the highest number of invaded bacteria among the tested cell lines. 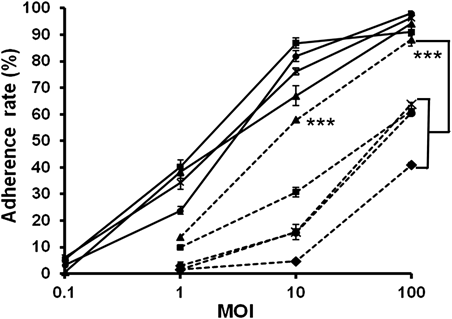 In contrast, the MDA-MB-231 cell line was the poorest host for L. pneumophila infection. Among the non-phagocytic cell lines, MCF-7 appeared to be the most appropriate and robust host cell line for bacterial infection. (a) Invasiveness of Th-gfp into different cell lines with MOI equal to 1 (gray bars, ) or 10 (black bars, ■). *** Significant differences (p<0.001) among the nine cell lines tested by Kruskal–Wallis’ test. (b) The intracellular growth profiles of the L. pneumophila strain in four macrophage-like cell lines, including J774.1A- (●), Raw264.7- (■), THP-1- (▲), U937- (×). (c) The intracellular growth profiles of the L. pneumophila strain in five non-phagocytic cell lines, including 16HBE- (●), Beas-2B- (■), MCF-7- (▲), MDA-MB231- (×), HeLa- (◆). * Significant differences (p≤0.01) at 72 h of culture tested by Scheffe’s test. The graphs show representative data from at least three independent experiments and are the average of three separate infections. Experiments were repeated three times. Error bars represent the S.D. The intracellular proliferation curves of Th-gfp in several macrophage-like and non-phagocytic cell lines are shown in Figs. 3b and c. For macrophage-like cells, the total number of bacteria in each well increased over time. In contrast, for the non-phagocytic cell lines, the total number of bacteria in each well decreased rapidly from 24 to 72 h, except for the wells containing 16HBE cells. For 16HBE cells, the bacteria proliferated from 48 to 72 h. In general, macrophage-like cell lines were better hosts than non-phagocytic cell lines for bacterial infection and intracellular growth. As shown in Fig. 4, the Th-gfp strain can be easily visualized within different mammalian cells by fluorescence microscopy. Intracellular bacteria were clearly seen even after 72 h of incubation (data not shown). This permitted us to directly observe the long-term, real-time interactions between live bacteria and live host cells. Nuclei were stained blue with Hoechst 33342. All imaged at 1000× magnification (size bar equal to 10 μm). Three obvious stages were observed in the intracellular proliferation of L. pneumophila, including vesicle formation (6 h), rapid proliferation (12 h), and release from host cells (18 h). The white arrows marked the irregular shape of the LCVs, and the red arrows marked the shape changes of the host nuclei during the infection of L. pneumophila. At the early stages of infection (0 or 6 h), the nuclei of host cells are intact, while the condensed or disappeared nucleus are observed at the final stage of the intracellular proliferation (12 or 18 h). The multiplicative processes of the Th-gfp strain in different cell lines were similar. Basically, three obvious stages were observed (Fig. 4): vesicle formation (Fig. 4, 6 h), rapid proliferation (Fig. 4, 12 h), and release from host cells (Fig. 4, 18 h). In the vesicle formation and rapid proliferation stage, the bacteria appeared as regularly arranged, short, stubby rods. At the end of each growth cycle, the bacteria are in vivo equivalents of stationary-phase bacteria; they appear as mobile rods that are ultimately released from the host cells (Fig. 4, 18 h). Compared with intact nucleus of host cell at the early stages of infection (Fig. 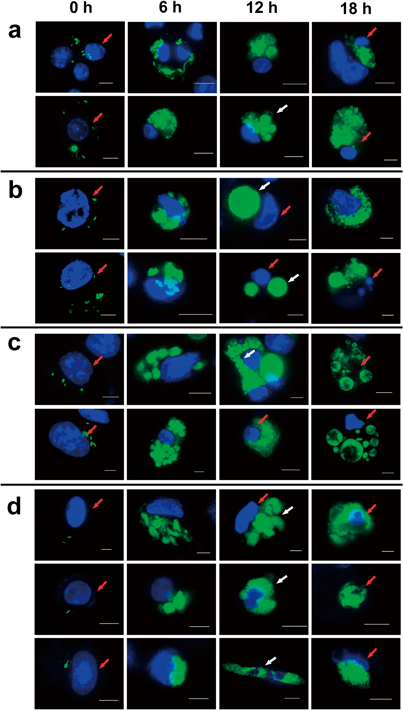 4, 0 or 6 h), the condensed or disappeared nucleus were observed at the final stage of the intracellular proliferation (Fig. 4, 12 or 18 h). However, there were some differences among the tested cell lines. In murine macrophage-like cells, Th-gfp occupied several small vesicles (Fig. 4a, 12 h). The volumes of these vesicles gradually increased as the rate of bacterial multiplication increased. The vesicles formed several replication vacuoles that occupied the entire cell. Conversely, in human macrophage-like cells and non-phagocytic cells, Th-gfp typically occupied several vacuoles that formed one or two large vacuoles (Figs. 4b–d). Compared to the regular round or elliptic vacuoles in macrophage-like cells, the Legionella-containing vacuoles (LCVs) in non-phagocytic cells were irregular shapes which look like irregular polygons or annular ribbon (Figs. 4c, d). In most of macrophage-like cells and non-phagocytic cells, LCVs occupied the entire cell, and they were released via cell disruption. In addition to the general release pattern, when some LCVs were released from the macrophage-like cells, it looked like exocytosis (Fig. 5). 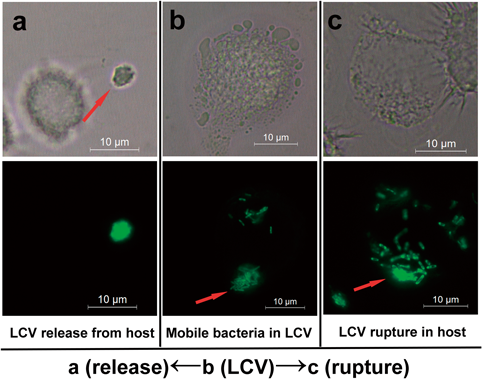 (a) LCVs that broke away from the host cells and released bacterial cells; (b) Mobile and loose bacteria in Legionella-containing vesicles (LCVs); and (c) LCVs released via cell rupture. The purpose of this study was to obtain a more complete understanding of the differences in L. pneumophila infection among different host cell lines by comparing bacterial intracellular growth and morphology during infection. For this comparison, in addition to the existing model cell systems in which Legionella species have been grown, we also tested two additional cell lines. In order to visualize the process of bacterial invasion, proliferation and escape, we successfully constructed a L. pneumophila strain that stably expressed high levels of GFP that could be used as a replacement for the wild type strain. Our experiments showed that the newly tested cell lines were able to support the intracellular growth of L. pneumophila. Variations in morphological characteristics during invasion and intracellular replication of the L. pneumophila strain in the different test cell lines were observed. Although it is not very clear how the bacteria are internalized by eukaryotic cells, many reports indicated that different mechanisms of uptake were used by macrophage-like cell and non-phagocytic cell.5,19–21) Our results indicated that internalization of L. pneumophila by macrophage-like cell lines were easier than that by non-phagocytic cell lines. Correlational analyses from our results showed positive correlation between adherence and invasiveness (Fig. S2). These suggest that the advantage for macrophage-like cell lines as the host of L. pneumophila probably begins at adherence stage. In addition, we found remarkable differences in the invasiveness of L. pneumophila among non-phagocytic cell lines (Fig. 3a). Previous studies showed that microfilaments, actin polymerization, and cell structural integrity play important roles in the uptake of L. pneumophila by non-phagocytic cell lines.22,23) We speculate that the differences might be related to differences in the characteristics of the membrane and cytoskeleton of these non-phagocytic cell lines. In accordance with other reports,18,24,25) our study indicated that macrophage-like cell lines were appropriate and robust host cell lines used as infection models. Some studies have indicated many mouse lines including C57BL/6 and BALB/c are resistant to Legionella because whose allele of NAIP5 harbors a number of polymorphisms.26,27) However, our results were in line with Barysheva et al. and Katagiri et al. showed that the total number of bacteria increased over time in murine J774.1A and Raw264.7 cells.25,28) The reasons for the deviation are not very clear now. Among the non-phagocytic cell lines, MCF-7 and Beas-2B cells were better hosts for up to 24 h post-infection, whereas 16HBE was a proper host between 48 and 72 h post-infection. MCF-7 is luminal epithelial cell line with the expression deficiency of caspase-3, which participates in epithelial cell apoptosis.29,30) Beas-2B and 16HBE are lung epithelial cell lines which are the actual host cells for Legionella.2,23,31) That may be the reason why these cell lines appeared to be the appropriate hosts among the non-phagocytic cell lines. The downregulation or inhibition of p53 could help Neisseria gonorrhoeae, Listeria monocytogenes, Shigella flexneri to survive and multiply in the host cytoplasm.32) Nevertheless, the results from our study (including proliferation curve and morphologic study) indicated that mutated p53 of MDA-MB231 had no obvious effect on intracellular growth of L. pneumophila. Our results from morphology analyses confirmed the multiplicative processes of L. pneumophila in macrophage-like cell lines is almost same as that in non-phagocytic cell lines.33) The different shapes of LCVs between murine macrophage-like cell lines and other cell lines may be related with the hosts own features. One report about intracellular trafficking of Mycobacterium avium in macrophage indicated that non-pathogenic Mycobacterium avium strains swallowed in macrophage appear to be processed to exocytosis.34) Thus, we speculate that inaccurate recognition of macrophage with LCVs may be the reason for the particular release pattern of L. pneumophila in macrophage-like cell lines. Since the first report of legionellosis, numerous studies of the invasiveness and intracellular proliferation of L. pneumophila have been published.35–37) Recent researches have revealed some probable mechanisms of bacterial internalization using the non-phagocytic host model, such as HeLa and L929.38–40) Our study extended the options with other two possible non-phagocytic cell lines. Accumulating evidence suggests that attachment and internalization of bacterium is related to the cell membrane surface receptors, cell morphology, and cell migration of host cells.41–43) The differences in the invasiveness of Legionella observed among these cell lines may help us determine the key surface proteins and mechanisms involved in bacteria uptake.39) Additionally, bacteria regulate their own proliferation and lysosome escape in host cell.44) The consistency and particularity of intracellular growth observed among the tested host cell lines may be related to the different biological functions of Legionella effector proteins in the different host cells.45) This might aid in the determination of the biological functions of effector proteins. This work was supported by a grant from the State Key Lab of Respiratory Disease, Guangzhou Medical College (2012–2015). The online version of this article contains supplementary materials. 1) Xiong L, Zhao H, Mo Z, Shi L. Prevalence of 7 virulence genes of Legionella strains isolated from environmental water sources of public facilities and sequence types diversity of L. pneumophila strains in Macau. Biosci. Trends, 9, 214–220 (2015). 2) Newton HJ, Ang DK, van Driel IR, Hartland EL. Molecular pathogenesis of infections caused by Legionella pneumophila. Clin. Microbiol. Rev., 23, 274–298 (2010). 3) Hoffmann C, Harrison CF, Hilbi H. The natural alternative: protozoa as cellular models for Legionella infection. Cell. Microbiol., 16, 15–26 (2014). 4) Chong A, Lima CA, Allan DS, Nasrallah GK, Garduño RA. The purified and recombinant Legionella pneumophila chaperonin alters mitochondrial trafficking and microfilament organization. Infect. Immun., 77, 4724–4739 (2009). 5) Dreyfus LA. Virulence associated ingestion of Legionella pneumophila by HeLa cells. Microb. Pathog., 3, 45–52 (1987). 6) Escoll P, Rolando M, Gomez-Valero L, Buchrieser C. From amoeba to macrophages: exploring the molecular mechanisms of Legionella pneumophila infection in both hosts. Curr. Top. Microbiol. Immunol., 376, 1–34 (2013). 7) Hilbi H, Segal G, Shuman HA. Icm/Dot-dependent upregulation of phagocytosis by Legionella pneumophila. Mol. Microbiol., 42, 603–617 (2001). 8) Jules M, Buchrieser C. Legionella pneumophila adaptation to intracellular life and the host response: clues from genomics and transcriptomics. FEBS Lett., 581, 2829–2838 (2007). 9) Molofsky AB, Swanson MS. Differentiate to thrive: lessons from the Legionella pneumophila life cycle. Mol. Microbiol., 53, 29–40 (2004). 10) Abu-Zant A, Jones S, Asare R, Suttles J, Price C, Graham J, Kwaik YA. Anti-apoptotic signalling by the Dot/Icm secretion system of L. pneumophila. Cell. Microbiol., 9, 246–264 (2007). 11) Siegl C, Rudel T. Modulation of p53 during bacterial infections. Nat. Rev. Microbiol., 13, 741–748 (2015). 12) Pasculle AW, Feeley JC, Gibson RJ, Cordes LG, Myerowitz RL, Patton CM, Gorman GW, Carmack CL, Ezzell JW, Dowling JN. Pittsburgh pneumonia agent: direct isolation from human lung tissue. J. Infect. Dis., 141, 727–732 (1980). 13) Miller JH. Experiments in molecular genetics. Cold Spring Harbor Laboratory Press, New York (1972). 14) Goodwin A, Kersulyte D, Sisson G, Veldhuyzen van Zanten SJ, Berg DE, Hoffman PS. Metronidazole resistance in Helicobacter pylori is due to null mutations in a gene (rdxA) that encodes an oxygen-insensitive NADPH nitroreductase. Mol. Microbiol., 28, 383–393 (1998). 15) Sexton JA, Pinkner JS, Roth R, Heuser JE, Hultgren SJ, Vogel JP. The Legionella pneumophila PilT homologue DotB exhibits ATPase activity that is critical for intracellular growth. J. Bacteriol., 186, 1658–1666 (2004). 16) Horwitz MA, Silverstein SC. Legionnaires’ disease bacterium (Legionella pneumophila) multiplies intracellularly in human monocytes. J. Clin. Invest., 66, 441–450 (1980). 17) Mintz CS, Chen JX, Shuman HA. Isolation and characterization of auxotrophic mutants of Legionella pneumophila that fail to multiply in human monocytes. Infect. Immun., 56, 1449–1455 (1988). 18) Berger KH, Isberg RR. Two distinct defects in intracellular growth complemented by a single genetic locus in Legionella pneumophila. Mol. Microbiol., 7, 7–19 (1993). 19) Horwitz MA. Phagocytosis of the Legionnaires’ disease bacterium (Legionella pneumophila) occurs by a novel mechanism: Engulfment within a Pseudopod coil. Cell, 36, 27–33 (1984). 20) Newton HJ, Sansom FM, Dao J, Cazalet C, Bruggemann H, Albert-Weissenberger C, Buchrieser C, Cianciotto NP, Hartland EL. Significant role for ladC in initiation of Legionella pneumophila infection. Infect. Immun., 76, 3075–3085 (2008). 21) Watarai M, Derre I, Kirby J, Growney JD, Dietrich WF, Isberg RR. Legionella pneumophila is internalized by a macropinocytotic uptake pathway controlled by the Dot/Icm system and the mouse Lgn1 locus. J. Exp. Med., 194, 1081–1096 (2001). 22) Garduño RA, Quinn FD, Hoffman PS. HeLa cells as a model to study the invasiveness and biology of Legionella pneumophila. Can. J. Microbiol., 44, 430–440 (1998). 23) Prashar A, Bhatia S, Tabatabaeiyazdi Z, Duncan C, Garduño RA, Tang P, Low DE, Guyard C, Terebiznik MR. Mechanism of invasion of lung epithelial cells by filamentous Legionella pneumophila. Cell. Microbiol., 14, 1632–1655 (2012). 24) Swanson MS, Isberg RR. Association of Legionella pneumophila with the macrophage endoplasmic reticulum. Infect. Immun., 63, 3609–3620 (1995). 25) Katagiri N, Shobuike T, Chang B, Kukita A, Miyamoto H. The human apoptosis inhibitor NAIP induces pyroptosis in macrophages infected with Legionella pneumophila. Microbes Infect., 14, 1123–1132 (2012). 26) Yoshida S, Goto Y, Mizuguchi Y, Nomoto K, Skamene E. Genetic control of natural resistance in mouse macrophages regulating intracellular Legionella pneumophila multiplication in vitro. Infect. Immun., 59, 428–432 (1991). 27) Zhao Y, Shi J, Shi X, Wang Y, Wang F, Shao F. Genetic functions of the NAIP family of inflammasome receptors for bacterial ligands in mice. J. Exp. Med., 213, 647–656 (2016). 28) Barysheva OV, Fujii J, Takaesu G, Yoshida S. Application of unstable Gfp variants to the kinetic study of Legionella pneumophila icm gene expression during infection. Microbiology, 154, 1015–1025 (2008). 29) Soule HD, Vazquez J, Long A, Albert S, Brennan M. A human cell line from a pleural effusion derived from a breast carcinoma. J. Natl. Cancer Inst., 51, 1409–1416 (1973). 30) MacFarlane M, Merrison W, Dinsdale D, Cohen GM. Active caspases and cleaved cytokeratins are sequestered into cytoplasmic inclusions in TRAIL-induced apoptosis. J. Cell Biol., 148, 1239–1254 (2000). 31) Cianciotto NP. Type II secretion and Legionella virulence. Curr. Top. Microbiol. Immunol., 376, 81–102 (2013). 32) Lemercier C. When our genome is targeted by pathogenic bacteria. Cell. Mol. Life Sci., 72, 2665–2676 (2015). 33) Abdelhady H, Garduño RA. The progeny of Legionella pneumophila in human macrophages shows unique developmental traits. FEMS Microbiol. Lett., 349, 99–107 (2013). 34) Cheville NF, Hostetter J, Thomsen BV, Simutis F, Vanloubbeeck Y, Steadham E. Intracellular trafficking of Mycobacterium avium ss. paratuberculosis in macrophages. Dtsch. Tierarztl. Wochenschr., 108, 236–243 (2001). 35) Fields BS, Benson RF, Besser RE. Legionella and Legionnaires’ disease: 25 years of investigation. Clin. Microbiol. Rev., 15, 506–526 (2002). 36) Price CT, Richards AM, Von Dwingelo JE, Samara HA, Abu Kwaik Y. Amoeba host-Legionella synchronization of amino acid auxotrophy and its role in bacterial adaptation and pathogenic evolution. Environ. Microbiol., 16, 350–358 (2014). 37) Copenhaver AM, Casson CN, Nguyen HT, Fung TC, Duda MM, Roy CR, Shin S. Alveolar macrophages and neutrophils are the primary reservoirs for Legionella pneumophila and mediate cytosolic surveillance of type IV secretion. Infect. Immun., 82, 4325–4336 (2014). 38) Nasrallah GK. A yeast two-hybrid screen reveals a strong interaction between the Legionella chaperonin Hsp60 and the host cell small heat shock protein Hsp10. Acta Microbiol. Immunol. Hung., 62, 121–135 (2015). 39) Day SR, Sifri CD, Hoffman PS. Infection of nonphagocytic host cells by Legionella. Methods Mol. Biol., 954, 463–478 (2013). 40) Schierack P, Nordhoff M, Pollmann M, Weyrauch KD, Amasheh S, Lodemann U, Jores J, Tachu B, Kleta S, Blikslager A, Tedin K, Wieler LH. Characterization of a porcine intestinal epithelial cell line for in vitro studies of microbial pathogenesis in swine. Histochem. Cell Biol., 125, 293–305 (2006). 41) Lighvani S, Baik N, Diggs JE, Khaldoyanidi S, Parmer RJ, Miles LA. Regulation of macrophage migration by a novel plasminogen receptor Plg-R KT. Blood, 118, 5622–5630 (2011). 42) Su PY, Wang YF, Huang SW, Lo YC, Wang YH, Wu SR, Shieh DB, Chen SH, Wang JR, Lai MD, Chang CF. Cell surface nucleolin facilitates enterovirus 71 binding and infection. J. Virol., 89, 4527–4538 (2015). 43) Marinho CF, Azeredo EL, Torrentes-Carvalho A, Marins-Dos-Santos A, Kubelka CF, de Souza LJ, Cunha RV, de-Oliveira-Pinto LM. Down-regulation of complement receptors on the surface of host monocyte even as in vitro complement pathway blocking interferes in dengue infection. PLOS ONE, 9, e102014 (2014). 44) Zhu W, Luo ZQ. Cell biology and immunology lessons taught by Legionella pneumophila. Sci. China Life Sci., 59, 3–10 (2016). 45) Xu L, Luo ZQ. Cell biology of infection by Legionella pneumophila. Microbes Infect., 15, 157–167 (2013).